The main difference between Monarch and viceroy butterfly is that monarch butterfly has strips extending from the top to the bottom of the hindwings whereas viceroy butterfly has a horizontal black strip crossing the vertical strips of the hindwing in the postmedian level. Both monarch and viceroy butterflies are unpalatable and they share the similar color pattern in their wings. Therefore, they are an example of Müllerian mimicry. Both butterflies have bright orange color with black strips. This bright orange color is a type of advertising coloration used to warn predators. A monarch butterfly is a large migratory butterfly with orange and black. They are mainly found in North America. This butterfly is about four inches wide when it opens its wings. The black veins are thicker in female’s wings than males. 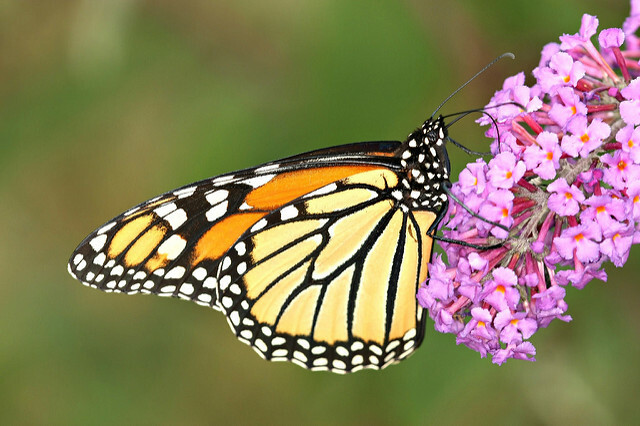 Monarch butterflies live in meadows and open fields with milkweeds during spring and summer. They spend the winter hundreds of miles away from the starting point and are found at high altitudes in central Mexico and on the coast of southern California during winter. A female monarch butterfly is shown in figure 1. The larva of this butterfly feeds on milkweed leaves. The adult depends on its nectar. Hence, they store alkaloids from the milkweed, which makes the taste of the butterfly horrible to its predators. Viceroy butterfly is a showy, North American nymphalid butterfly, closely mimicking the monarch in coloration. Its color and the pattern of the black strips are same as the monarch butterfly. However, viceroy butterflies are smaller than monarch butterflies. They also have a horizontal, black strip on their hindwing. Viceroy butterflies have tiny hairy forelegs. Hence, they are called brush-footed butterflies. A comparison between monarch and viceroy butterflies is shown in figure 2. During both larval and adult stages, viceroy butterflies depend on the willow, poplar, and aspen for their diet. Hence, they taste horrible to their predators, same as the monarch butterflies. As mentioned above, both viceroy and monarch butterflies share similar coloration as well, warning their predators to not to eat them. Therefore, both monarch and viceroy butterflies share Müllerian mimicry. Monarch and viceroy butterflies have forewings and hindwings. 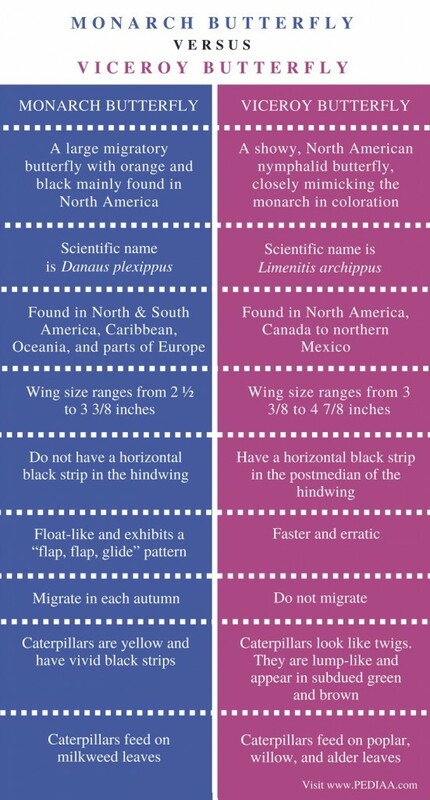 Both have similar coloration in the wings with bright orange with black color strips. Both have black strips extending from top to bottom of the hindwing. The border of the wings of both butterflies is black and consists of several white spots. Both butterflies exhibit Müllerian mimicry. The bright orange color in both is a type of advertising coloration used to warn predators. Both undergo complete metamorphosis wherein the eggs, caterpillars, and the adults are the stages of their life cycle. Caterpillars of both types of butterflies feed on leaves with foul-taste and toxic chemicals. Caterpillars incorporate toxic chemicals into the body of the adult butterfly. The monarch butterfly has black strips, which extend from top to bottom of the hindwing while viceroy butterfly has vertical black strips as well as a horizontal black strip, crossing the vertical strips. Both monarch and viceroy butterflies share a characteristic bright orange color and vertical, black strips. They are an example of Müllerian mimicry since both species are unpalatable and share similar warning coloration. However, the main difference between monarch and viceroy butterfly is the presence of a horizontal, black strip in the viceroy butterfly. 1. “Monarch Butterfly – Danaus Plexippus.” Atlantic Puffin – Fratercula Arctica – NatureWorks, Available here. 2. “Viceroy Butterfly – Limenitis Archippus .” Atlantic Puffin – Fratercula Arctica – NatureWorks, Available here.